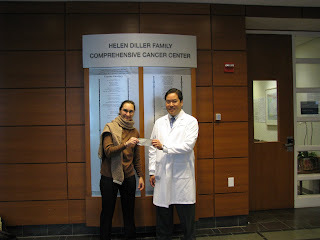 Beat Sarcoma recently donated $15,000 to help fund Dr. Nakakura's sarcoma research at University of California San Francisco. Dr. Nakakura is active in bench-to-bedside (translational) studies aimed at earlier detection of neuroendocrine tumors at at time when there is still the possibility of surgical resection. He is also investigating new and novel therapies for patients with advanced disease who have inoperable tumors. Dr. Eric Nakakura is a cancer surgeon who specializes in tumors of the pancreas, bile ducts, liver, and gastrointestinal tract. He also treats soft tissue sarcomas, including tumors of the retroperitoneum, trunk and extremities. At the UCSF Helen Diller Family Comprehensive Cancer Center, he participates in the management of complex gastrointestinal tract cancers, soft tissue sarcomas and gastrointestinal neuroendocrine tumors, including carcinoid and islet cell tumors. For more information on Dr. Nakakura's research, visit http://surgicaloncology.surgery.ucsf.edu/faculty/surgical-oncology/eric-nakakura,-md,-phd.aspx.